Yifei Zhong gets audience with President Obama, Chinese president in D.C.
MTSU’s School of Music involves graduate music majors from across the nation and abroad in a strong community with tight bonds. Eight Master of Music specializations are offered, but the program is interdisciplinary, with a vocalist in a classroom beside a composer beside a musicologist, etc. Internationally renowned faculty members perform, compose, teach, conduct, publish, and present their research or music continually, from South Korea to Costa Rica to Rome. A low faculty-to-student ratio enables high-quality personalized instruction and collaboration. Instrumentalists are involved in coaching undergrads from the beginning, and graduate assistants enjoy opportunities reserved for doctoral students at other institutions. Students and faculty benefit from and contribute to Nashville’s nearby music industry and arts scene. Ensembles range from wind bands, orchestras, big bands, choral ensembles, and an opera company to a vocal jazz ensemble, myriad combos and chamber ensembles, an old-time music group, percussion ensemble, steel drum band, and a salsa band. Core classes are offered on evenings and weekends to accommodate those who work full-time. International composer Jesús Santandreu decided to attend MTSU after professor Dr. Reed Thomas invited him to the U.S. premier of two symphonic works Santandreu wrote the year before. “When I heard the symphonic band and the wind ensemble rehearsing my pieces, an electrifying emotion came to me,” he says. “Their sound and accuracy was glorious.” As a master’s student, Santandreu (2000, Berklee College of Music) could study conducting and work closely with a wind and symphonic band on a regular basis. “It would help to have a better understanding of orchestration and bring the opportunity to try new material right on the field,” he says. An acclaimed jazz saxophonist, he also calls the jazz area his “temple” and enjoys the jam sessions, music scene, and Nashville Symphony Orchestra nearby in Music City. The Wind Ensemble featured Santandreu's Sortes Diabolorum on its recent NAXOS recording. His symphonic pieces also have been played in Spain, Portugal, Germany, Brazil, and Colombia. Kara McLeland, who studied musicology for her 2013 master’s in music, sings with the Forte Femme a capella ensemble of eight females (plus one male bass voice). “We have been busy arranging and recording songs, filming music videos, and performing live,” McLeland says. She also teaches as an adjunct music professor at MTSU and Nashville State Community College; is finishing a solo music project; and performs in local theater, such as Actors Bridge Ensemble’s Next Fall recently. She chose MTSU for location, affordability, and the quality of the music faculty. McLeland also earned a Graduate Certificate in Women's and Gender Studies. “I've been surprised how much my studies in musicology and WGST have influenced my artistic endeavors,” says McLeland, also a songwriter and musician. “I find myself creating and being drawn to projects that have social relevance." As a feminist artist, she sometimes shines a light on and wrestles with issues she found troublesome during her studies, such as the marginalization of women. 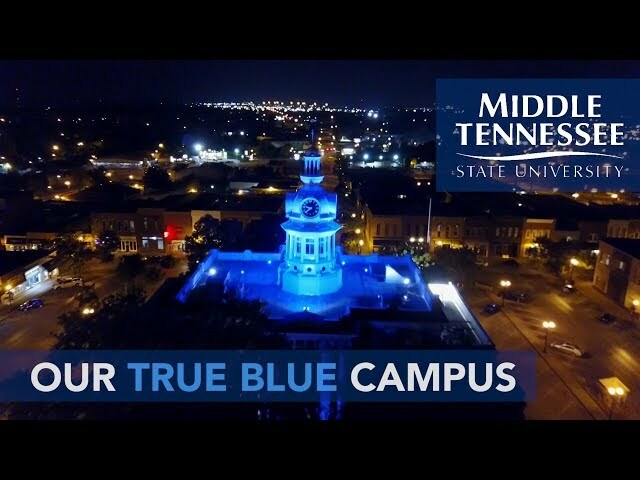 MTSU awards the Master of Music (M.M.) degree with eight specializations offered: collaborative piano; conducting; jazz studies; music composition; music composition for contemporary media; music education; musicology; and performance. A minor in Music is offered at the graduate level. Undergraduate minors in Music, American Music Studies, and Music Industry are also available. Music, Collaborative Piano Specialization, M.M. The School of Music offers a Master of Music degree with specializations in collaborative piano, conducting, jazz studies, music composition, music composition for contemporary media, music education, musicology, and performance. A minor in Music is offered at the graduate level. an acceptable grade point average in all college work taken (at least 3.00). Additionally, those seeking a specialization in collaborative piano must complete an audition. Applicants who do not pass the audition may be allowed, at the discretion of the faculty, to be admitted with probationary status for one semester and must register for MUAP 5020 - Private Instruction. They must re-audition at the end of their first semester of study. Students who do not pass the audition on their second attempt will be excused from the program. successfully complete both written and oral comprehensive examinations no earlier than the student's last semester of study. Comprehensive examinations may be repeated once. Additionally, those with a specialization in collaborative piano must establish proficiencies before graduation in music history, music theory,* and foreign language. The foreign language proficiency for collaborative piano includes translation skills (in two of Italian, French, German) and diction skills and IPA in Italian, French, and German. *NOTE: Diagnostic examinations in music theory, music history, and diction will be scheduled during the first week of the first semester of study. Students who do not pass the diagnostic examinations should consult with the graduate coordinator to plan how to meet the requirements. Courses taken to meet proficiency requirements do not count toward the degree. Survey of bibliography and problems and methods of research. Analysis and evaluation of research in the arts. Prerequisite: MUS 6620. Study and research of a topic in music determined by the instructor. Prerequisite: MUTH 5010 or permission of instructor. Skills and procedures of musical analysis as they apply to all periods through analysis of representative compositions. Evaluation of work from all standpoints: craftsmanship, expression, and stylistic correctness. Prerequisite: Completion of undergraduate recital. Consult graduate coordinator as to performance area availability. One-hour private lesson per week in the selected performance field. In-depth study of stylistic, technical, and musical problems in music performance and exploration of advanced repertoire in the applied area. Prerequisites: Completion of MUAP 6682 for the collaborative piano specializations; MUS 6030, MUS 6060, and MUAP 6709 for the conducting specialization; the appropriate courses from among MUAP 6681-MUAP 6688, MUAP 6691-MUAP 6698, and MUAP 6701-MUAP 6708 for the jazz studies and performance specializations; MUAP 6140, MUAP 6150, and MUAP 6160 for the music composition and music composition for contemporary media specializations; and permission of the appropriate music faculty in all specializations. One-hour private lesson per week in the selected performance field and recital preparation until recital completed. Those specializing in collaborative piano may take course three times. NOTE: The vocal and instrumental repertoire may be split between the two recitals in any combination, as long as the final result is approximately 50 percent in each area. Basic repertory of Italian airs, German lieder, French art song, and solo vocal works of nationalistic schools, as well as English and American song literature. A study of major operatic works and styles. Focuses on composers, librettists, and performers as well as the vocal, musical, and dramatic resources necessary for performance. Listening and analysis of select pieces will be included in student projects. A study of chamber music written for the piano. Emphasis will be placed on music written during the eighteenth, nineteenth, and twentieth centuries. Listening and analysis of select pieces will be included in student projects. Please see undergraduate catalog for information regarding undergraduate program. Additionally, those seeking a specialization in conducting must complete an audition. Applicants who do not pass the audition may be allowed, at the discretion of the faculty, to be admitted with probationary status for one semester and must register for MUAP 5020 - Private Instruction. They must re-audition at the end of their first semester of study. Students who do not pass the audition on their second attempt will be excused from the program. Additionally, those with a specialization in conducting must establish proficiencies in music history, music theory,* and keyboard. * NOTE: Diagnostic examinations in music theory and music history will be scheduled during the first week of the first semester of study. Students who do not pass the diagnostic examinations should consult with the graduate coordinator to plan how to meet the requirements. Courses taken to meet proficiency requirements do not count toward the degree. Analysis and marking of scores. Refinement of conducting techniques. Elimination of undesirable conducting habits. Diction as applied to conducting. Techniques in advanced conducting of orchestral, choral, band, and chamber ensembles. Includes irregular meters, score reading, warm-up procedures, conducting patterns, attacks, and releases. Prerequisite: Completion of undergraduate recital. Consult graduate coordinator as to performance area availability. One-hour private lesson per week in the selected performance field. In-depth study of stylistic, technical, and musical problems in music performance and exploration of advanced repertoire in the applied area. Course may be repeated with no limit, but only three hours of credit may be applied toward the degree within the nine-hour private instruction requirement. An in-depth study of orchestral and wind ensemble repertoire. Improving teaching in instrumental music classes through a study of rehearsal planning and techniques; the interpretation of music to students; group dynamics. Examines choral literature from the Renaissance to the present. Program selection. Analysis of choral pieces. The fundamentals of arranging musical works for vocal ensembles of various sizes, combinations, and skill levels. Music, Jazz Studies Specialization, M.M. Additionally, those seeking a specialization in jazz studies must complete an audition. Applicants who do not pass the audition may be allowed, at the discretion of the faculty, to be admitted with probationary status for one semester and must register for MUAP 5020 - Private Instruction. They must re-audition at the end of their first semester of study. Students who do not pass the audition on their second attempt will be excused from the program. Additionally, those with a specialization in jazz studies must establish proficiencies in music history and music theory*. *NOTE: Diagnostic examinations in music theory and music history will be scheduled during the first week of the first semester of study. Students who do not pass the diagnostic examinations should consult with the graduate coordinator to plan how to meet the requirements. Courses taken to meet proficiency requirements do not count toward the degree. Study of the history and literature of jazz music including African roots, developments, and aspects of style periods, and the contemporary state of jazz. Listening and analysis. In-depth study of materials and techniques for teaching jazz at the high school and college level. Rehearsal techniques and identification of and solutions to performance problems. Study of the development and implementation of a successful jazz studies program including educational jazz festival administration. Prerequisite: MUTH 4170. Advanced analysis and arranging for various combinations of instruments and voice for small and large jazz ensembles. Periods, performance practices, stylistic features, and artists. Explores the art of improvisation. Emphasis on advanced harmonic and melodic principles and on the development of a personal style. Listening and analysis of solos by great jazz artists and in-class performances of student projects and improvisations. Music, Music Composition for Contemporary Media Specialization, M.M. Additionally, those seeking a specialization in music composition for contemporary media must submit recordings and scores of three to five of their compositions. Additionally, those with a specialization in music composition for contemporary media must establish proficiencies in music history and music theory* and establish proficiency in a performance skill on an applied instrument or voice and in keyboard (may also fulfill performance-skill requirement). Development of skills and ability in handling musical materials with goals of some individual style or expression within the framework of current practices. Taken in consecutive order with MUAP 6150 and MUAP 6160. Development of skills and ability in handling musical materials with goals of some individual style or expression within the framework of current practices. Taken in consecutive order with MUAP 6140 and MUAP 6160. Development of skills and ability in handling musical materials with goals of some individual style or expression within the framework of current practices. Taken in consecutive order with MUAP 6140 and MUAP 6150. MUAP 6160 may be repeated with no limit, but only three hours of credit may be applied toward the degree. Styles and compositional techniques found in representative masterworks of the twentieth century from Debussy to present. Analysis, listening, and research. Includes history and techniques, acoustics, electronic sound generation, recording, operation of audio equipment, basic principles of composition, and experience with tape recorders and a music synthesizer. Open to nonmusic majors with permission of instructor. Prerequisite: MUTH 5190. Advanced principles of digital sound synthesis, programming the digital synthesizer, electronic composition, contemporary trends in digital music, and programming with a MIDI work station. Prerequisites: RIM/MUTH 4290 and RIM 4400 or permission of instructor. MIDI systems design and the total integration of all MIDI-controllable devices. SMPTE and MIDI Time Code and their application to tape synchronization. A continuation of advanced techniques for digital sampling, sequencing, sound manipulation, and use of alternate controllers. Other topics include sound effects and music scoring for film and video, and the MIDI Machine Control and MIDI Show Control specifications. Laboratory required. Music, Music Composition Specialization, M.M. Additionally, those seeking a specialization in music composition must submit recordings and scores of three to five of their compositions. Additionally, those with a specialization in music composition must establish proficiencies in music history and music theory* and establish proficiency in a performance skill on an applied instrument or voice and in keyboard (may also fulfill performance-skill requirement). Music, Music Education Specialization, M.M. Additionally, those seeking a specialization in music education must submit a 30-minute video recording of themselves teaching. Focuses on contemporary issues and research in music education, the current educational landscape, learning theory and music education, curriculum design and assessment, and accountability in music education. Prerequisite: MUS 6620 and completed candidacy form. Study and research of a topic in music education determined by the student. S/U grading. Focuses on effective evaluation and assessment strategies for the K-12 music education classroom, how assessment data may be most effectively used to improve music teaching and learning, and the current research priorities for assessment in music education. The role of music and music teaching in elementary education; its objectives, methods, materials, and procedures; innovative trends and exemplary practices; evaluative techniques. Music fundamentals, materials, and methods appropriate for preschool through grades three; pantomime, role playing, improvisation, rhythm, movement, listening, and singing. Methods for teaching music to students at the middle and senior high levels (grades 5-12). Topics include recruitment, auditions, repertoire, programming, musical analysis and score preparation, planning rehearsals, rehearsing the choir, classroom management, vocal techniques and musicianship skills, changing voice, and overall management of a choral program. Observation and public school field experiences required. Introduces graduate students in music education to methods and materials available for teaching general music to students in grades 6-12. Active student participation and observations of music teachers in the school expected. Prerequisite: Marching band class. Further development and application of marching band techniques as utilized in half-time and contest show production. Selection and analysis of the music score. Introduction to music technology and its applications in music education. Topics include electro-acoustical generation of musical sound, synthesis equipment and MIDI networks, sequencing and scoring software, music education instructional software, and recording techniques. Application assignments in the computer lab and reading assignments in references and software and hardware manuals. Students will search for, examine, and log relevant World Wide Web and other Internet sites. The School of Music offers a Master of Music degree in Music with specializations in collaborative piano, conducting, jazz studies, music composition, music composition for contemporary media, music education, musicology, and performance. A minor in Music is offered at the graduate level. Additionally, those seeking a specialization in musicology must submit two (2) research papers of at least five (5) pages in length, one of which is on a music topic. Additionally, those with a specialization in musicology must establish proficiencies in music history, music theory*, and foreign language. Musicologists must establish proficiency in one of the following languages: French, German, or Italian. *NOTE: Diagnostic examinations in music theory and music history will be scheduled during the first week of the semester of study. Students who do not pass the diagnostic examinations should consult with the graduate coordinator to plan how to meet the requirements. Courses taken to meet the proficiency requirements do not count toward the degree. Types of research in music surveyed. A problem is selected and developed into a thesis report in acceptable form and style. Once enrolled, student should register for at least one credit hour of master's research each semester until completion. S/U grading. Additionally, those seeking a specialization in performance must complete an audition. Applicants who do not pass the audition may be allowed, at the discretion of the faculty, to be admitted with probationary status for one semester and must register for MUAP 5020 - Private Instruction. They must re-audition at the end of their first semester of study. Students who do not pass the audition on their second attempt will be excused from the program. Additionally, those with a specialization in performance must establish proficiencies in music history and music theory. * Vocalists must also establish proficiency in diction and in two languages from among French, German, and Italian.